Scanner for Remote Desktop creates a virtual scanner on the server and allows driver free scanning via any application in a remote session using a local scanner. 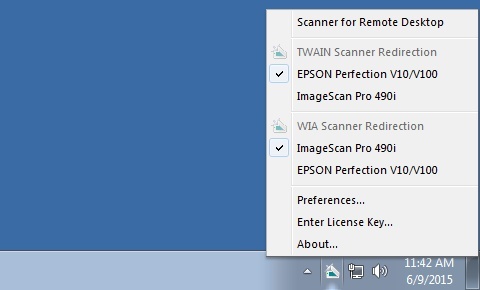 The scanners are isolated within each individual session, so you don\'t need to scroll through a long list of scanners in the scan dialog to find the one plugged into your workstation! The program supports 3 color modes and 3 resolutions, scanning on more than 10 standard paper sizes.